On Sunday, October 29, 2017, Deacon Josh Butler visited New Life to share his long experience ministering to men in prison, including those on death row. He spoke of the challenges associated with this work and shared stories about the incarcerated people with whom he has maintained relationships. Deacon John invited New Lifers to consider the ministry of writing to prisoners, and offered to help guide them in their journey. Visiting prisoners is one of activities God encourages us to do. Members of New Life are passionate about being God’s hands and feet in our hurting world, so welcomed Deacon Josh’s message. Congregants were also very excited to see him! He served as Deacon at New Life for several years in the early 2010’s. During his time with New Life, he helped several members begin their own prison ministries. In 2014, Deacon Josh advised New Lifers Dave and Darlene Giffin as they began writing to and visiting a prisoner on death row at the Ohio State Penitentiary in Youngstown, Ohio. To cover for Dave and Darlene when they are away, Lynn Gorman also joined the effort to minister to this prisoner. 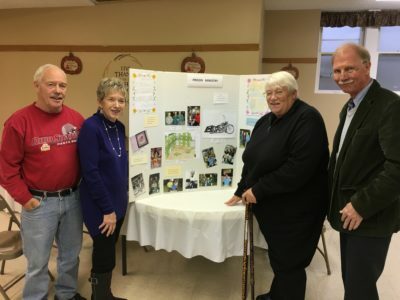 L-R, Dave and Darlene Giffin, Lynn Gorman and Deacon Josh Butler with a display board highlighting activities with the person they minister to in prison. Anyone who is interested in writing to or visiting a prisoner, contact Darlene or contact the church office at (330) 699-3554.